There are plain old solid colors of pants and then there are baseball pants with piping. It’s just a subtle difference but look really cool. I personally think having piping down the pant leg looks a little more serious or professional. When you see players out on the field with team color piping on their pants you know they are serious. White pants with piping are the most popular ones but I’m going to give you five categories. I really hope you find some really cool piping for baseball pants whether you are a player, coach or parent. The last thing you want is pants that don’t fit. Some parents are sick of not finding something long enough or one’s that won’t swallow them up. You won’t find any issues in that regard with these. My favorites are the youth quantum plus ones because the piping seems to be a little more prominent. I also prefer the grey color because the colors seem to stand out better. You can get these in different piping colors so make sure you check all the options. I’m also a big fan of cheap baseball pants for men and youth. One pair that you should pay particular attention to is the Easton Rival pants. Parents say they fit their kids great and they are especially stoked because the price is so low. Designed specifically to fit a youth sized body. 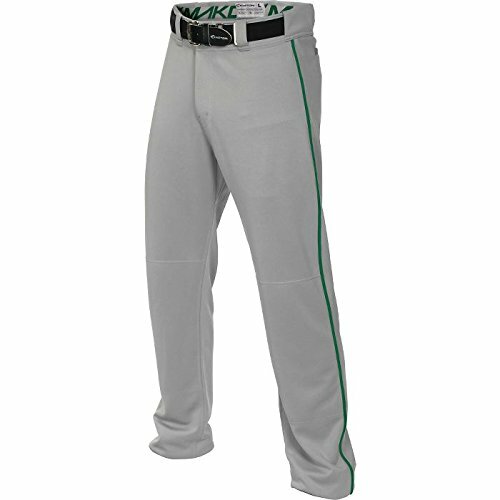 Youth relaxed fit baseball pants with 1/8" piping. 100% polyester warp knit material (350 cloth). Zipper fly front with belt loops. When it comes to the color white you want to find something that will wear really well and wash really well. Don’t forget to watch the video at the bottom of this page to see how to wash them really good. These are a great collection of white baseball pants with piping. There are many different brands represented and most of them have options as far as which color you want piping down the leg. Most pants are usually polyester material and are very easy to take care of. What is your favorite color of piping? You can literally get pretty much any color you want. Is your team color red? It’s available. Gold? It’s available. Take a look at this educational video that will help you look the best you can on the field. I don’t see many bad comments anywhere about the Easton brand. You can usually find a quality pair for a quality price. These are the best of the rest of the Easton one’s with piping. I have a few in the first two sections above but these are great too. You can get most of these in many different sizes and colors as Easton really puts a lot of work in to provide for everyone’s needs. Do you have a favorite out of this bunch? Everybody seems to love the men’s Rival. This is one of the better pairs of white baseball pants with black piping. You won’t find this pair anywhere else on this page. It happens to be made by Easton and they are a very high quality pair of pants. They tend to run a little large so many think about getting a size smaller than you’re normally used to. They are also very fairly priced at a discount actually so make sure you check these out. Some players really prefer Wilson pants with piping. The number one positive remark I’ve seen in the reviews is that they are super comfortable. Other people remarked that the price was just about right for the quality of materials with these pants. Most all of these are considered relaxed fit because that’s what’s most comfortable for players these days but you can find one pair of classic fitting pants down below. 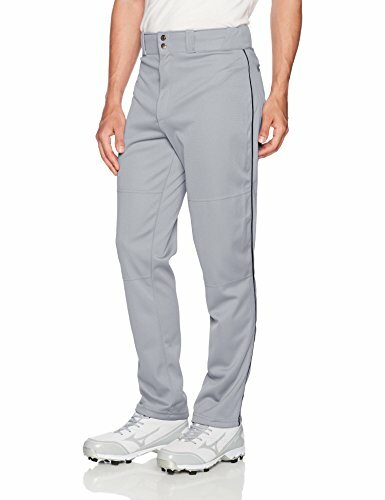 If you are looking for comfort and a great deal then you’ve got to check out these Wilson baseball pants with piping. Keeping your white baseball pants clean and in great condition isn’t as easy as throwing them in the washer and hoping for those stains to come out. Check out this video which contains several helpful tips. It’s not the easiest task to find baseball pants but I’ve show you all the possibilities. There are a ton of colors to choose from and a size for everyone too. I’ve tried to list as many of the top brands as possible. The brands that come in a close second place are Mizuno youth baseball pants with piping, Rawlings piped baseball pants and finally Champro baseball pants. Once you choose your color and find a comfortable fit then it all comes down to preference whether that being a brand or price. My advice is to find the pair of pants that is going to make you perform the best on the field. Go for it! Cheap Mens Baseball Pants - Will They Actually Fit or Not? Under Armour Baseball Pants – Do They Fit Nicely For Players? Champro Baseball Pants – Great Quality For Budget Price?